G'day travellers everywhere! 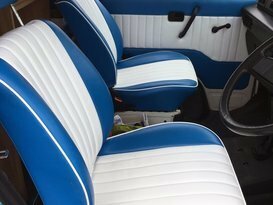 I'm Crush the VW Kombi, full of cool, retro charm. I come with the basic creature comforts for an epic road trip and adventure. I have 4 seat belts but prefer to stick to 2 people, but if you want to put the kids in a tent alongside that's fine. Get the Wiki Camps app and go! Hi guys!! My engine is brand new and I've completed 18,000 trouble-free kilometres in the last 18 months, so you can be assured of my total reliability. I'm a manual 5-speed, easy to drive and very easy to park (being a normal car size). Bedding, crockery and incidentals are supplied. So, what are you waiting for? Let's go and have some fun in the great outdoors - my pop-top can be raised and lowered in 60 secs, the awning in 2 mins, just set up the camping chairs and you are ready to relax, somewhere in paradise. By the way my fridge is 28 litres and runs 24/7 off a second, deep-cycle battery. It's worth pointing out that I'm 28 years old now making me a nice example of when motoring and travelling was a simpler affair. This means that on a roasting hot summer day my aircon will be less efficient, and may not cope with a build up of heat, day and night. My seats are very comfortable (no complaints so far! ), but are vinyl covered and will be sticky when wearing shorts etc., however it’s easy to sit on a beach towel. In response to your , I got window tinting installed to help keep you cool. Thanks to the lovely respectful hirers (from Europe, Brazil and Oz) who have so far taken me on trips to Margaret River and the south west, from the beach to the forest and beyond. In the middle of summer I prefer not to travel inland - its too hot. I'm not really suitable for the long drive up to Exmouth either, or further east than Esperance or Kalgoorlie. I've also been rocking out at music festivals too, notably Fairbridge and Nannup. Please, NO smoking, NO speeding. Max. 200km per day (average over the hire period). Extra kms: 50c per km. Avoid dirt roads where possible especially if its wet/raining. Please respect me like I'm owned by you. 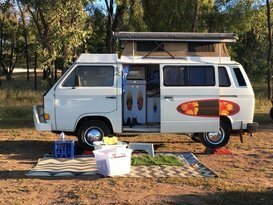 We hired Crush the Combi Camper van for 10 days to explore our South-West... it was a fun, trouble free, memorable experience. Nick explained everything at pick up. My husband did the driving of this 5 gear floor shift manual. The engine was awesome and handled the roads beautifully. Effective aircon/comfortable seats. The little frig which ran off a second battery was always on and kept everything cool. Setting up was always quick and easy as well as packing up ready for the road. We stayed in caravan parks each night - sometimes on unpowered sites. Make sure petrol is topped up and dont let it drop below a quarter as the last quarter goes down quickly. Nick always communicated promptly. He includes 200km per day allowance. Any km over is 50c per km. We went a bit over our 2000km but well worth the holiday experience. Visiting Lucky Bay & doing the Tree Top Walk in Valley of the Giants have been on our bucket list forever. We have such an awesome South West and Crush was a fantastic way to experience nature. We rented crush for 2 weeks to do a round trip towards Albany and back up the coast, visiting national parks as we went along. 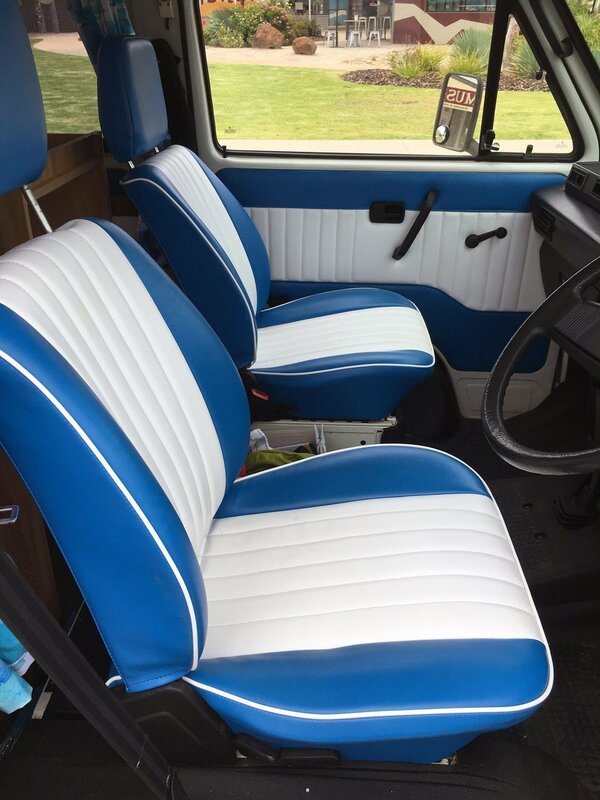 Crush is kept beautifully, and you are guaranteed to be the envy of every other camper you encounter. In addition, crush has 2 batteries that are quite powerful so we got away with booking non-powered sites and saved quite a bit of money. They only thing requiring a powered site would be the microwave, but hey - there was a BBQ on every camping ground we visited. Crush drives very nicely as well. The gears are a little different than what I was used to (first gear is the bottom left rather than the top) but I got used to that very quickly. We cruised at a comfortable ~100 km/h and had no issues with performance. The bed comes with an extra mattress that you can put on top and was quite comfortable. We slept very relaxed in all weather (the south was quite a bit colder than closer to Perth). Crush comes with a great little fridge that will run on battery for quite a while and keeps everything cold. There are also USB outlets around the van in the front and back where you can charge phones and other devices. There are normal outlets too though we didn't use them. Nick was a great host! Communications were flawless and he offered heaps of tips on where to camp or where to drive to. There were absolutely no issue with pickup or drop-off or any communication while on the road. This is a great way to spend your time in Australia and save money on accommodation along the road! And, Crush being a normal sized van, it is a much nicer experience driven than the bigger alternatives. We spent 10 days with Crush and could not be happier. Nick was great to deal with and Crush lived up to all expectations, adding to a great time around the south west. I honestly couldn't recommend hiring Crush the Kombi more! We hired the van for a week long adventure around Margaret River and in all weather imaginable were safe, sound, comfy and had the absolute best time. We had a surfboard with us the whole time and there was more than enough room inside for two adults to sleep and to keep the board safely inside. Nick was fantastic in all communications prior to hiring and also during our trip with helpful tips, and just general help. The five star service didn't even end there, he happily offered to give us a ride to the airport, surfboard and all. 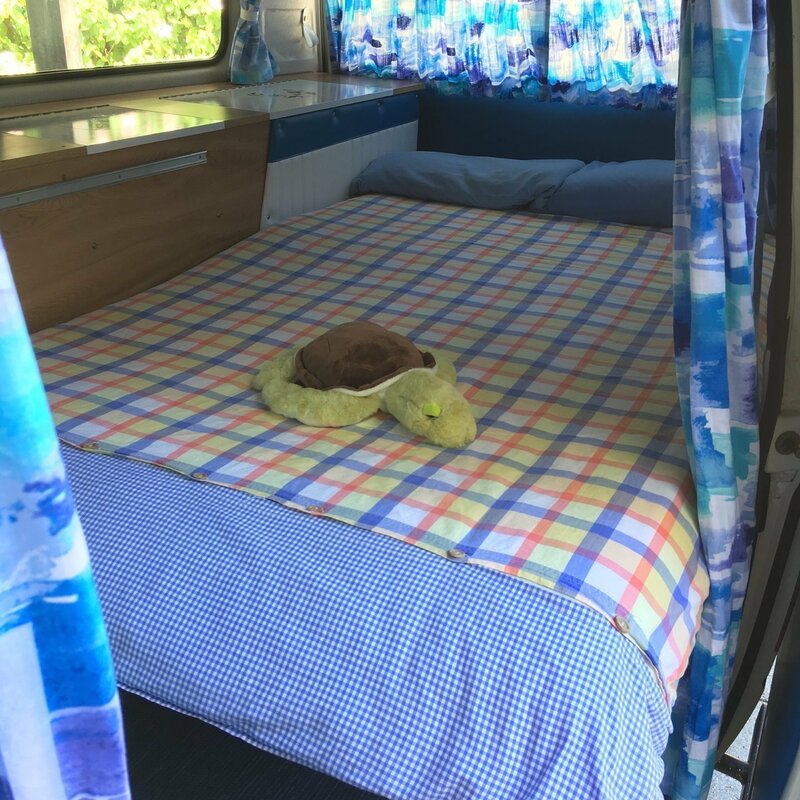 If we're even over in WA again, Crush will be our first point of call as there's so much more to see, more adventures to be had and we couldn't imagine doing it in a better home on wheels. There isn’t enough space to share how wonderful my adventure with Crush was! 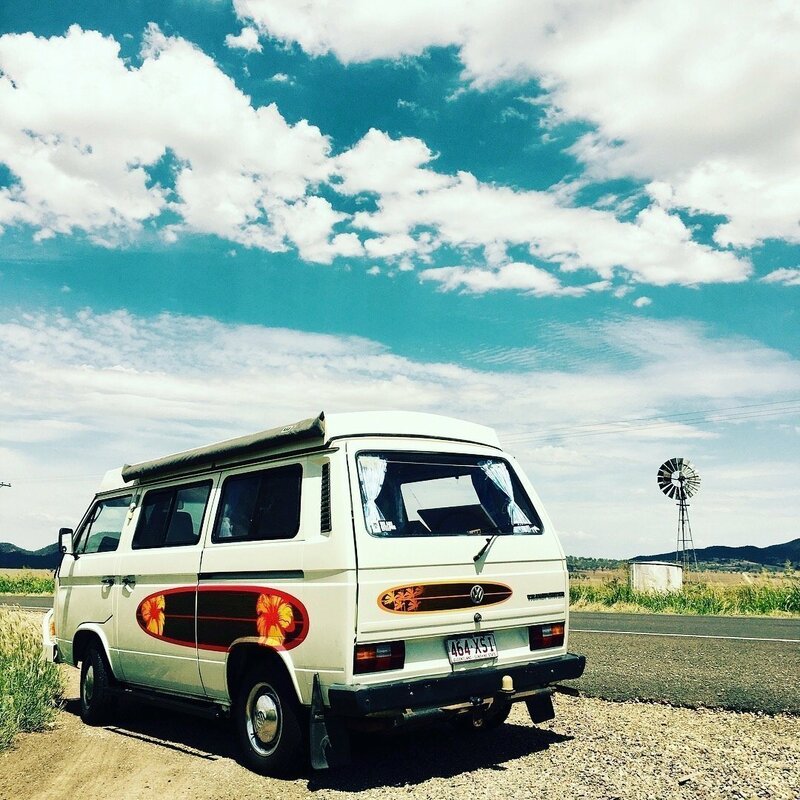 This Kombi van is just perfect to get out of the city and take to the open road for an adventure you’ll never forget. 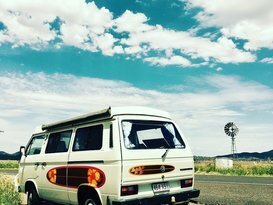 I traveled for 11 days solo doing a loop of South West Australia. All up I did 2500+km in Crush and it was a joy every minute. Weather wise I had hot sunny days and cold rainy days and Crush was comfortable in every situation. Mechanically the van drives great, everything works just as it should - in fact I was suprised just how powerful and smooth the drive is given the age. Both outside and inside is very clean and tidy, it’s obvious how well Crush is cared for. I felt safe and secure both while driving and at night sleeping. The bed is super comfy (only one of me, but it’s room enough for two) and it folded out easily. I kept it made up as a bed most of the time but you can easily convert it for day space with a table that inserts in front of the seats if you want. 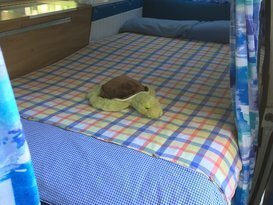 Nick is an amazing ‘campervan host’, it was like borrowing from a mate. He was always quick to answer messages when I messaged from the road, and happy to share suggestions. We are from Germany and booked Crush for 4 day and went to Margaret River. Our stay and the days with Crush where such amazing. It is a really lovely Campervan with a lot of comfort. Nick the owner is great, helpfully and a really friendly guy. Crush made our trip perfect. 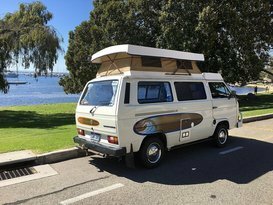 We had a lot of fun, made amazing pictures and for sure, we will never forget this trip with an old VW to travel in Australia. I absolutely recommend Nick and Crush! Great way to spend a long weekend! Nick keeps Crush spotless. The bed was very comfortable and we slept very well. Nick is very quick to reply to any questions.